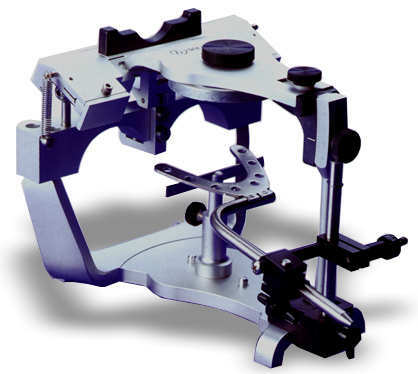 The Denar Mark II articulator enables models to be accurately mounted on an instrument that is mechanically programmed to simulate the patient's mandibular movements. Each articulator comes with 2 metal and 10 plastic mounting plates, a flat plastic incisal table, a curved/calibrated incisal pin, instruction manual, adjusting wrench, and carrying case. Several different incisal tables are also available. These are interchangeable and the plastic types can be used for custom guidance/anterior guidance table use. Note: Denar products are only available to qualified dental practitioners.